- a cat, typically one that does not have a pedigree or is otherwise unremarkable. The European Union could ignore its own rules if it wants to avoid a hard border in Ireland after Brexit and simply agree not to create one in any circumstances, the leading backbench Conservative Brexiteer Jacob Rees-Mogg has said. 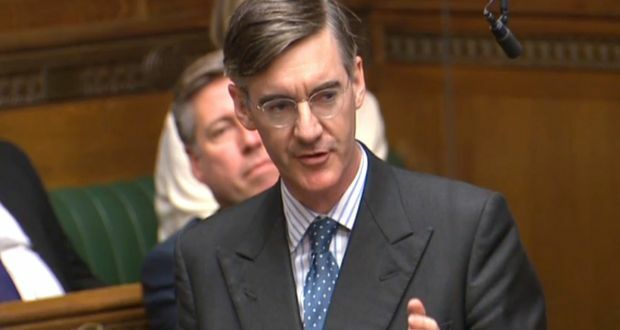 Mr Rees-Mogg, who chairs the European Research Group of pro-Brexit Tory MPs, said Theresa May should call Ireland's bluff rather than allow the Border issue to hold Brexit to ransom. "Will the Irish put up a border? Will a government that has always believed there should be a single government across the whole island of Ireland suddenly put up a wall? Is it going to be a Trump-like wall built by Mr Varadkar? The British government has repeatedly said it will not impose a border, so it is entirely up to Mr Varadkar, " he told The Irish Times. "I think we can easily negotiate a deal on trade across the Border, but I don't think this issue should hold us to ransom on doing everything else, which is what it's currently being used for. "I think we should simply make it clear that we will not put up a border and that is our position. And what would the Irish do if the EU insisted? I think that is a really interesting question. I think we should call that particular bluff." Britain and the EU have agreed that there should be no return to a hard Border, and Ms May, the prime minister, has acknowledged that a unilateral British commitment not to create new barriers was not enough to resolve the issue. Mr Rees-Mogg said he disagreed with the prime minister and dismissed the EU's argument that its rules demanded that it should police its external borders and protect the integrity of the single market and the customs union. "It wasn't possible for Italy to join the euro. But lo and behold the rules were waived. It was not possible for Greece to join the euro, but lo and behold Goldman Sachs fiddled the figures and Greece joined. The four freedoms are indivisible, except when it comes to the association agreement with Ukraine, when lo and behold the freedom of movement of people - oh dear, we are not going to have that," he said. It would suit Brexiteers just fine if they could use Ireland as a back door to by-pass the Customs Union and access the Single Market free of all the obligations and charges that Norway is subjected to. I somehow doubt Angela or Brussels would wear it. Rees-Mogg is right about one thing, though: It would be politically suicidal for Varadker to agree to erecting customs controls at the border with N. Ireland. A bloody civil war was fought in Ireland between those who accepted a de facto border and those who didn't. We do not want to revisit those dark times. This goes beyond politics. The best the Irish government could do would be to erect outward bound customs controls at Irish air and sea ports ensuring no UK originating goods could enter the rest of the EU that way without the appropriate tariffs or inspections being carried out. That would leave the island of Ireland in a sort of no man's land - part of both the Single Market and the Customs union, but also part of a free travel and trade area with the UK - as was historically the case prior to EU entry in 1973. For all the bigoted, sectarian stupidity of the DUP, there might also be some method to their madness: It would put N. Ireland in the extraordinarily privileged position of providing British firms with an alternative gateway to the EU and access point for EU imports free of any tariff/import controls the UK government might seek to impose, given their absolute opposition to customs controls in the Irish sea. Of course the UK government could always implement the "friction free", "imaginative" technological solutions it has been attempting to sell to the Irish government, involving "trusted trader" schemes and customs collection mechanisms in companies similar to VAT returns. No one has ever done it before, but then neither has anyone left the EU before. I actually think such a scheme could work for larger companies like Guinness or Tesco. Guinness already has customs officers on site to ensure that the correct amount alcohol is declared for duty purposes. Tesco has systems in place to ensure tax compliance in many jurisdictions in the world. It would be feasible, if not exactly simple, for those systems to be programmed to charge the correct amount of duty on goods originating in different jurisdictions depending on whatever tariff regimes need to be applied, less of course for any exemptions due to tariff free quotas being applicable. Similar to VAT in some respects. But what of smaller firms, sole traders and private citizens? Effectively, Ireland would become a tariff free zone - or smuggler's paradise - depending on your point of view. In an overall EU context, the amounts concerned might well be negligible. If few tariffs are applicable in any case, the impact within Ireland might also be small, but provide a welcome boost to smaller businesses trying to compete with global giants. Given that Ireland is the economy most exposed to the impact of Brexit, the EU might even take a sympathetic view and tolerate any such boost as reasonable compensation for the other adverse effects of Brexit. However the EU is not quite as laissez faire with its own rules as Rees-Mogg seems to imply. There are plenty of anomalies if you look hard enough - e.g. Greenland is part of the Kingdom of Denmark, but no longer part of the EU - but they all have one of two things in common: They are either small enough to be immaterial, or the EU has learned to rue their occurrence - as in Greek entry to the Eurozone. Rees-Mogg may well be right and an exception for Ireland may be made - at least until the longer term future of EU/UK terms of trade are clarified. But there is no way the EU will allow Ireland to become a back door providing UK goods with an opportunity to by-pass customs controls and gain entry to the Single market without Norway style terms of membership being applied. You got all the way through that without mentioning that his investment fund opened an Irish entity to work around Brexit problems? Mogg is entirely mendacious. He doesn't believe what he says. We don't have to take it seriously. His aim is to crash out of EU into swivel eyed free marketeer utopia, ruled over by PM Mogg. Nothing else matters. Most UK investment funds are busy implementing Brexit strategies which aim to get around any problems Brexit may create - chiefly by locating part of their businesses in EU jurisdictions. Somerset Capital management, the company he co-founded, and which still pays him c £170K p.a. for 30 hours a Month work, is no different in that regard. Brexit could well represent a business opportunity for them. The UK media don't seem to be overly concerned that there might be a conflict of interest in Rees-Mogg advocating a hard Brexit. But the purpose of my post is to explore the implications for Ireland and the EU of not putting customs controls at the border. Rees-Mogg may be exploiting the issue to secure "back-door" access to the single market for UK firms: I think he is deluded if he thinks the EU will allow that to happen. But the issue could create real problems for Varadker and be a God-send for Sinn Fein and assorted smuggling gangs. So Ireland and the EU had better have a Plan B in the even of a hard Brexit. I haven't seen that articulated anywhere else, hence my post. You answer your own question. EU border security is a problem for third-country smugglers to solve. EU-member cooperation to control capital (drugs, currency, securities, feed, live stock, fuels, etc) flow has been reported ad nauseum. EU-member cooperation to control EU human flows has been reported ad nauseum. Intercepting contraband at EU continental borders and ports may be inefficient, but not incompetent. Mogg's particulars have no effect on UK political status viz EU controlling laws, euphemisticaly addressed "hard border" to spare the pride of lawful EU dependents soon to inhabit the same island as third-country nationals. No new EU plan is required to subject UK capital and labor to third-country controls. Daily solicitation of spectators to offer methods how UK smugglers can circumvent EU controls is tiresome, if not an uncanny mirror of Tory gov. Services accounted for 39% of the £276 billion of UK exports to the EU or £108 billion in 2017. A ten percent tax would raise 123.5 billion, enough to fund any number of roving patrols, electronic tagging equipment, surveillance drones, random pull overs, etc. Second thing is to put the onus of enforcement on the good producer. Put a 250% tax on the sales value of any goods caught being smuggled and charged to the producer of the good. I'm not quite sure how you detect (say) financial services being exported across a border through "roving patrols, electronic tagging equipment, surveillance drones, random pull overs, etc." unless you are using the revenue derived from services taxation to fund goods exports tax evasion detection! Certainly having roving patrols would be less emotive than fixed infrastructure at the border, but nevertheless it would be quite controversial, as you are enforcing a border within Ireland, one way or the other. Financial service funds are detected at the point they are constructively received or when the funds are transmitted for services rendered. Enforcement is a couple of lines of computer code. Using the tax on financial services to fund anti-smuggling detection is one of the beauties of the idea. It creates a powerful Border-at-the-Irish-Sea group within the UK. Moogie is calling for the UK to actively engage in an criminal conspiracy to smuggle goods across international borders. As a member in good standing of the EU Ireland needs to take active steps to put a stop to it. If the government of the Republic of Ireland can't put that across then they need to go back to grade school and let some people with a modicum of sales and marketing skills take over. And actually the hassle to the citizens of the Republic would be minimal. Few people go wandering around the countryside with an intermodal cargo container attached to the back of their vehicle. I see it otherwise. Imposing border checks to the movement of goods would be a cruel way of showing the people of NI how they have been forsaken by Britannia. And that there is far more that brings together than apart. And correct me if I am wrong, weren't the British checkpoints the primary target of violence during the troubles? Why would a republicn target a checkpoint of the Republic? "Why would a republicn target a checkpoint of the Republic? " You could also ask why would a post box be the target of Scottish terrorists. The main difference was that the English gave in to the Scots, and the problem was solved. but grossly unfair. They should have taken the mean. "Her Majesty Queen Elizabeth the 1 1/2th"
So what number should the next King Charles be? There was Charles I and II of the Stuart line but that ended when Anne croaked without whelping a sprog in 1714. George I of the House of Windsor took over in 1714 and on through to QE 2 with nary a Chuck becrowned. So Chuckie could be Charles III if it's purely numerical or Charles I Rev. 2 indicating the break in the line. Personally I find the venereal distribution of power bizarre beyond words in the 21st Century. Personally I think of it as more of a soap opera which probably helps the UK fashion, broadcasting, entertainment and tourism industries more than it actually costs to run. The downside is that it also plays a key role in keeping the UK class structure in place, the real costs of which are probably incalculable. One can make a case the British class system was the major contributing factor to the UK throwing away the chemical industries of the late 19th century, throwing away the computer industries of the last century, and throwing away the basic technology of the jet engine. Charles Stuart Parnell, the uncrowned King of Ireland? a border can survive without much policing if there is goodwill on both sides. However, as we know from the days of the Troubles, thee are significant bodies of people for whom the idea of goodwill is an alien and detestable concept. It's not so much that there will be evasion of revenue duties, I suspect that both governments have already factored that in. Rather it is the smuggling of cheap goods which are banned. this will almost all be from the UK into the EU with US foodstuffs of questionable adulterations flooding though to undermine the more hygenic production in the EU. Not that scum like ree-smugg gcares, he's probably got his little tax avoidance/evasion schemes all lined up with his passport to the unaligned pacific island of his choice to legitimise it all. To them brexit was never about taking back control on behalf of the british people, but simply about ending pesky oversight into his future career as a money grubber for various oligarchs. rough start to the day? No, brexit is becoming too obviously a gift cart for the uber rich hoping for a smorgasbord of tax evasion/fee gathering opportunities. They don't care about the Irish border for the simple reason that they don't give a stuff about trade. Making things and selling them is too much small beer for the likes of Boris or Fox. they like hanging out in luxurious hyperspace where banker meets gangster in high profit, low risk money transfers that benefit absolutely nobody except those in the know. That's what they call "taking back control". They will hang about on yachts in the Mediterranean while the rest of the UK desscend into some Somalia-like dystopian nightmare.